That’s what a forensic team is about to find out. Pretty cool. …to slash federal funding for Civil War battlefield acquisition in half? If a Confederate monument falls in Reidsville, does it make a sound? Yes, it does. In fact, it raises quite a ruckus. REIDSVILLE, N.C.—Mark Anthony Vincent says he was tired and distracted as he drove his van through this city early one morning last May to deliver auto parts, and dozed off. Mr. Vincent says he looked at his GPS just before 4:47 a.m., when the 1999 Chevrolet ran off the road and slammed into a 101-year-old Confederate veterans monument in Reidsville’s central roundabout. The van struck the 32-foot-tall granite pillar, jostling a 6-foot marble statue of a Confederate soldier, which toppled onto the van and broke into at least 10 pieces. The soldier’s head slammed through the van’s hood, crushing the engine. Example #28476193 of why cars and monuments don’t mix. Watch where you’re going, people. Many in Reidsville thought insurance would pay for a replacement and that would be that. Instead, two groups with different views of what the monument symbolized are squaring off in a debate over the statue’s future. The fight reflects the South’s continuing struggle over how to commemorate the Civil War. No, it doesn’t. It reflects the continuing struggle between heritage groups over how to commemorate the Civil War. The other 100 million people in “the South” have other things to worry about. Read on. The statue’s owner—the United Daughters of the Confederacy, which collected $105,000 in insurance money for the piece—plans to repair the base of the monument, replace the statue and move the whole thing to a cemetery away from downtown. The statue’s broken pieces now lie in the city’s public-works yard. Too late for that, dude. “How sad that the City is attempting to eradicate the history and memory of those that sacrificed so much,” one fan wrote on the Facebook page. Look, if municipal authorities had ordered the monument torn down, then it would be a case of the city “attempting to eradicate the history and memory of those that sacrificed so much.” The UDC claims ownership of the monument, they want to repair it and relocate it, and the city agrees with them. Not exactly a case of eradicating history. The HPAC—which contends that either the city or the state owns the statue—joined with the Sons of Confederate Veterans, a national heritage group, to hire a lawyer to press the state to intervene. The state refused. Now the HPAC has started raising money for a possible lawsuit against the city or the United Daughters. The threat of legal action has left the statue’s repair and replacement in limbo. The SCV is pitching in to call for government involvement to thwart a decision by the UDC. There are so many levels of irony here that I’m getting dizzy. Wait, it gets even more bizarre. Conspiracy theories abound that Mr. Vincent, who is black and lives in Greensboro, about 22 miles from Reidsville, wrecked the statue on purpose, even though it almost killed him and destroyed his van. Police found no basis for such theories, Mayor Festerman said. Mr. Vincent has an unresolved traffic citation for the crash. Yes, they’re accusing a distracted driver of a kamikaze attack on a monument. Heritage controversies—the cure for all those occasions when life makes too much sense. In the fall of 1861, Felix Zollicoffer, the Confederate general responsible for the troublesome eastern section of Tennessee, moved north from Cumberland Gap along the Wilderness Road into the mountains of Kentucky with about 5,400 men. Union forces in the Bluegrass State responded by sending a small detachment of raw recruits to Wildcat Mountain near present-day London. The Confederates badly outnumbered the force at Camp Wildcat, so on Oct. 2oth they were reinforced by the arrival of additional troops under Brig. Gen. Albin F. Schoepf, bringing their total to 7,000. They arrived just in the nick of time; the next day, the Confederates launched an attack on a hill occupied by the 33rd Indiana. The Union troops’ stubborn resistance convinced Zollicoffer that Wildcat Mountain couldn’t be taken by assault, so the next morning saw the Yankees still in possession of the ground and the Confederates returning southward toward Cumberland Ford. 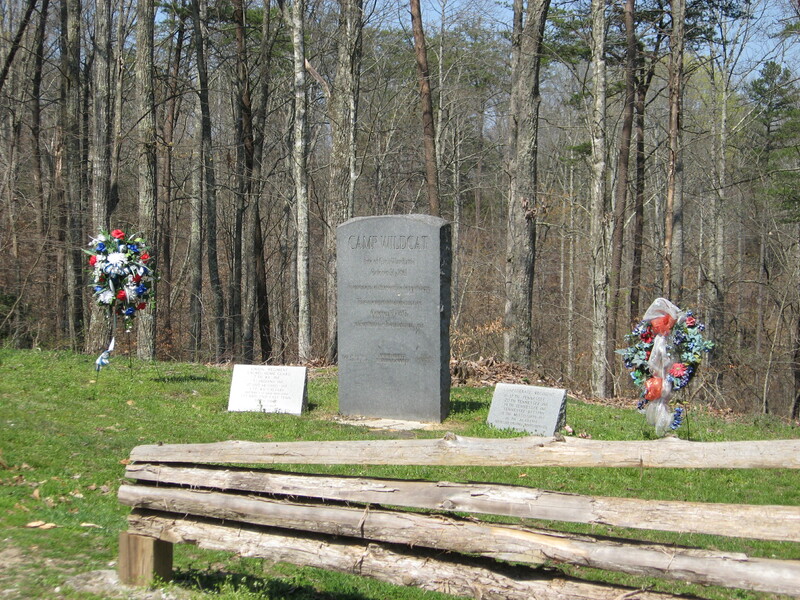 The Battle of Wildcat Mountain/Camp Wildcat was small by Civil War standards—the Union forces suffered around 2o casualties, the Confederates around 50—but Zollicoffer’s withdrawal the night of Oct. 21st marked the end of his first attempt to secure control of eastern Kentucky, and gave the Union its first victory in that state. Today the Camp Wildcat Preservation Foundation preserves and interprets the site of the battle. I got the chance to pay a visit this week. Getting to Wildcat Mountain is both easy and difficult. Easy, because I-75 cuts right through the part of eastern Kentucky where it’s located; difficult, because the site itself is in a rugged, wooded, mountainous area, and the only access is via a narrow gravel road. But it’s well worth the effort. An interpretive kiosk offers visitors an overview of the events leading to the battle and the way in which the struggle played out on the wooded slopes. There are two trails, one of which takes you past the original bed of the old Wilderness Road to a monument near the site of the Union camp. The longer trail, about an hour’s hike, takes you to Hoosier Knob, the hill where the most intense fighting took place. Both trails feature signage and various interesting sights along the way; to see the whole battlefield requires about an hour and half to two hours. What impressed me most about the battlefield was the obvious dedication of the CWPF in developing the site. Its location and the nature of the terrain present considerable difficulties to anyone trying to interpret it, but there were a number of visitors there when I arrived, and a large tour group stopped by later in the day. It’s a great place to learn about the Civil War in the Appalachian border region, so see it if you get the chance.